"A favourite at Aboriginal Pow Wows all summer long." Whisk flour, baking powder, sugar, and salt together in a large bowl; stir in water just until a fairly sticky dough forms. Set aside to rest while oil preheats. Divide dough into 6 equal portions. Flatten each portion into a round disc the size of your palm. Fry dough discs, one at a time, in hot oil until browned on one side, about 2 minutes; turn over with tongs and cook until browned on both sides, about 1 minute more. Drain fry bread on paper towels; repeat with remaining dough. Cook and stir ground beef in a skillet over medium heat; stir in chili seasoning and kidney beans and cook until heated through, about 5 minutes. 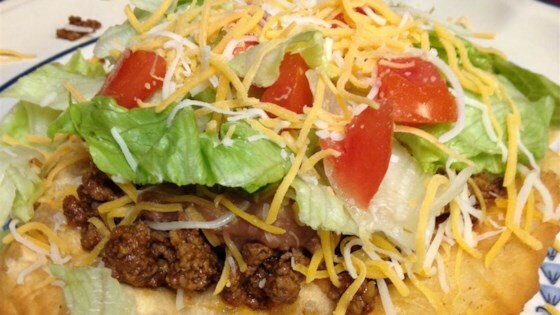 Place fry bread on a plate; top each fry bread with a portion of chili mixture, shredded Cheddar cheese, lettuce, tomatoes, and sour cream. Lukewarm milk can be substituted for lukewarm water. Dip the fry bread dough into a bowl of flour if it is too sticky to work with. For easier eating, especially at picnics, cut cooked fry bread into crouton-sized pieces; divide onto individual plates before adding remaining ingredients on top. Not impressed although I was real excited to try it. The bread was so sticky and very hard to fry. Maybe this wouldn't be so bad if you just put mixture in a flour tortilla or on a bed of Fritos. I loved the filling and the toppings. But I'm not a big fan of fried bread and pretty much that what it was. If your a person who likes fried bread then you would enjoy this. Yuuuuummmmm!!! Will be making this again, thank you! Tasty and filling. This is a recipe I will make again.